To thank you for being a part of our blog during its inception we thought we’d give one of you lucky readers a present during our birthday month. 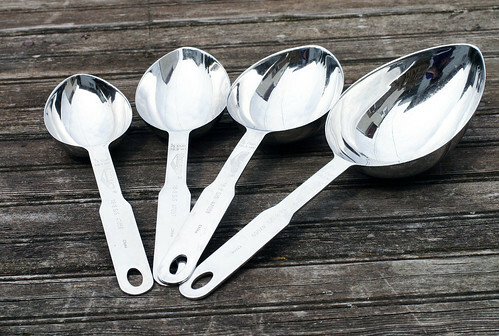 First up is a set of heavy duty, stainless steel, Vollrath, oval measuring cups……….who doesn’t love sparkly kitchen gadgetry!? 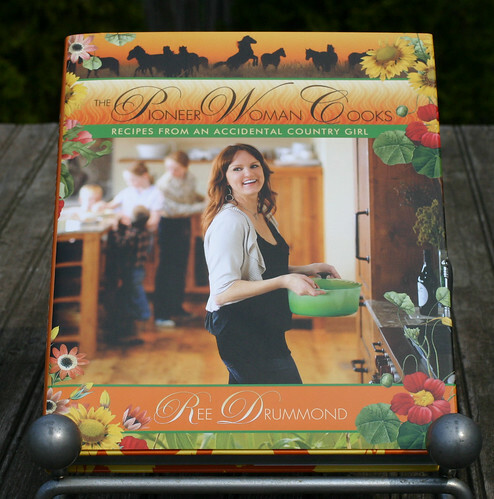 Next up is The Pioneer Woman’s Cookbook! Want another chance to win? Just become a fan on our FaceBook page and leave a comment there under the Giveaway post saying to count you in! Continental U.S. only. One entry per person at each location. Winner will be selected using Random.org. All entries received after the Giveaway closing day and time will not be considered. Entries that do not follow the entry requirements will not be considered. Winner will be notified via email and will have 24 hours to confirm receipt of the email. If the winner does not reply within 24 hours, another winner will be selected. My signature dish is Beef Stroganoff. Nice giveaway! Now even though I am vegan I used to cook many dishes that I still do for my husband and for company. Hmmm…signature dish….I’m more an apps or dessert girl when presenting to others….maybe an app platter or artichoke cups, 7-layer dip, and squash turnovers? Lovely giveaway! So nice of you to honor your friends. A signature dish for me, hhhhmmm definitely chicken. Crispy, spicy oven fried chicken! You know I love those Panko crumbs with some heat. Oh what a great giveaway and Happy Birthday. I’m more of a dessert girl, but everyone loves my Mac n Cheese. Chocolate Cake with Chocolate Frosting – there’s nothing better! Signiture appetizer: spianch and artichoke dip. Signature Dish: Chicken Romano. Simple dishes that ALWAYS get tons of compliments. Not entering, since a I have a few of those lovely silver items! And hubs gave me the cookbook for Christmas. My signature dish would have to be spaghetti and meatballs. Great giveaway–thanks for the opportunity. And happy Blogiversary! Congrats! My signature dish is buffalo chicken chili — it uses 1/4 C. Tabasco sauce + a jalapeno or two, and it is fabulous! My signature dish is my Scottish shortbread…. mmmm, good. Congrats!! My signature DIP is my cheesy, lemony crab dip, and my signature DISH is curried chicken…..after a lot of tweaking with both original recipes that is! My signature dish is swedish meatballs over rice, and zucchini ratatouille! Great giveaway, and happy birthday! Definitely has got to be my chocolate cupcakes! Yum! Signature Dish: Flank Steak Salad with French Fries and Fresh Veggies! My signature dish is a pot roast, a real easy one that is cooked in the oven wrapped in foil for 3 – 4 hours. My whole family loves it. My signature dish would have to be Boeuf Bourguinon! This month my signature dish is Brisket! oooooo I like the idea of a seasonal/monthly signature dish – especially for those that cook a lot! I am one of those don’t cook types-I read your blog so I can give hubby the recipes! I do make some mean french onion soup, does that count? Happy Blog Anniversary! Signature dish? It has to be fried rice….my boys love it and are always requesting for it. Congratulations on the birthday of your wonderful blog! Great giveaway items! Happy Happy birthday to your wonderful blog!!! My signature dish would be a rosemary & molasses chicken with sweet potatoes. My signature dish, or at least one of the them is Pulled Pork. My signature dish is zesty chicken enchiladas, a Texan favorite! Love your site, happy birthday! my signature dish? ANY THAI DISH !! When my husband and I were still dating, the first gift he gave me was 3 cookbooks of Thai food. He loves thai food and he wanted me to learn how to cook it for him. Told him I can’t cook something well until I taste the real thing. LOL. He took me to Thailand (several times in the last 22 years that we’ve been married) and darn did I ever learn how to cook thai food properly!!! Happy anniversary! My sig dish is Shrimp and Crab Cannelloni. My signature dish would have to be my shrimp and grits. Nothing fancy, but totally tasty! My signatures dish is a Healthy Chicken Chilli! My signature “dish” is sticky buns! They are made from the first recipe I ever wrote myself, and they’re SO GOOD! I would say my signature dish is Spaghetti Bolognese. Or maybe Chicken Divan. Definitely comfort food. My signature dish is salmon with orange brown sugar glaze. Happy B-Day Foodo! Happy blog birthday! My signature dish is chicken with an orange marmalade glaze.